There are other organizations doing similar, inspiring work. University of Oxford, Harvard University, and Dubai’s Museum of the Future have worked together to create the Institute for Digital Archaeology (IDA), which distributes 3D cameras to residents in areas attacked by ISIS so that ancient buildings and artifacts could be documented before they are lost to war forever. The Million Image Database project aims to document historic and archaeological locations all around the world, using 3D photography to capture dimensions and specifications. The data is archived so that artifacts and structures can be recreated through 3D printing in case of damage. The organization aims to collect one million 3D images of these endangered historic sites, and has already captured more than half a million images, thanks to the 5,000 3D cameras that have been distributed. With technology and innovation, powered by the rise of 3D scanning and printing, all things are possible. Quite soon, in fact, 3D printing will allow us to take these stunning digital imprints and do more than view them through the filter of a hologram or virtual reality headset. Smaller versions, printed to scale on the home 3D printers that will soon exist in households across America, will offer endless opportunities for education and cultural enrichment. But the potential is much grander, as well. In the very near future, harnessing these digital libraries and the immense bandwidth offered by a giant like Google, we will also be able to fully recreate cherished heritage sites, using not just light and shadow, but actual brick, mortar, and 3D-printed concrete. 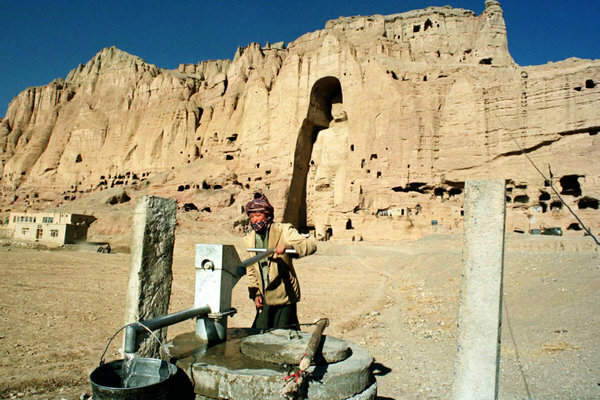 The Buddhas of Bamiyan will rise again in that lush valley, not just as a beautiful light show for one night only, but as living, tangible proof of the resilience of human creativity in the face of senseless destruction. Just imagine if we do the same for the Temple of Bel in Palmyra; the libraries at the University of Mosul; and the Armenian Genocide Memorial in Syria. It’s no longer a far-off dream. The technology is ready. With the wonders of 3D, we’ve found a new way to fight for the preservation of our cultural and spiritual monuments, powered by brainpower and the collective will of humanity.